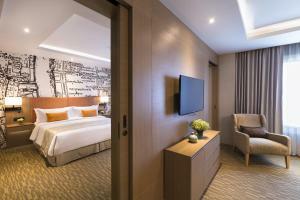 Grand Mercure Bangkok Fortune is only a few steps away from Rama 9 MRT Station and Fortune IT Mall. It offers stylish accommodation, an outdoor pool and a fitness centre. Free Wi-Fi is available throughout the hotel. On-site parking is possible. 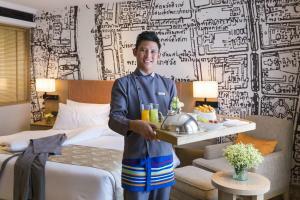 The hotel is a 5-minute walk from Grand Central Rama 9. It is a 10-minute drive to Esplanade Entertainment Complex, Thailand Cultural Centre and Siam Niramit. Suvarnabhumi International Airport is a 30-minute drive away. 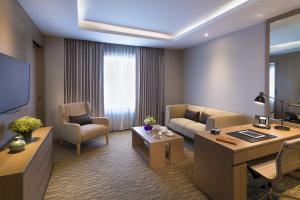 Decorated in warm colours, rooms and suites are provided with air conditioning, a seating area and a TV. They come with safety box and minibar. En suite bathrooms come with shower facilities and free toiletries. 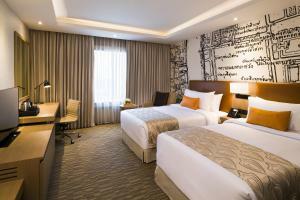 For convenience, the hotel offers a 24-hour front desk, meeting facilities and a business centre. Other facilities and services include sauna, car rental and babysitting. World Restaurant - One Ratchada serves a variety of international dishes. Other dining choices include Cantonese cuisine at Nan Yuan Restaurant and Japanese food at Agehan Restaurant. Lounge Metro Le Rendez Vous offers a variety of refreshing beverages. All reservations must be guaranteed with a valid credit card when checking in, unless otherwise specified. Upon check in, the hotel requires the card holder to present the credit card used for making reservations otherwise the hotel will require an alternative method of payment. 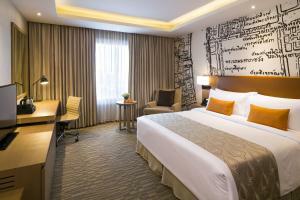 Located on higher floors, rooms offer air conditioning, a seating area and a flat-screen TV. En suite bathroom comes with a bathtub. Rate: THB 3041.37 ... THB 9745.56; select dates below to get current rates. Located on the top floor, rooms feature contemporary interiors. They offer air conditioning, a seating area and a flat-screen TV. 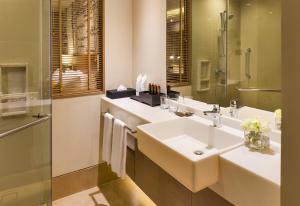 En suite bathroom comes with shower facilities and free toiletries. Spacious suite located on the top floor. It offers a separate living room with a seating area, a TV and air conditioning. En suite bathroom comes with a bathtub. Rate: THB 2974.24 ... THB 9745.56; select dates below to get current rates. This twin room features a minibar and air conditioning.